Recently I had the privilege of conducting a masterclass at Millikin University. Teaching a masterclass wasn’t all that unusual for me, but the topic certainly was! Although I’m very familiar with the “Freehand Technique” (hereafter referred to as the FHT) and have been using it for years, I’ve never actually TAUGHT the technique before. I’m really glad that I did, however, as it really caused me to look at it in a different way and go back to some of the basics in understanding it and its potential. I really owe all my knowledge and understanding of the FHT to Johnny Rabb. I often tell the story of the first time I heard Johnny play drums. We didn’t know each other at the time, and I had been hearing a lot of rumblings about this “new” drummer causing a scene. When I finally got a chance to hear him do a clinic, I was mostly impressed by his musicality and the fact that here was someone doing something NEW and different… Now there are a lot of really great drummers out there; and of course everyone has their own unique sound. But Johnny was doing some different things, and the music that he was coming up with felt almost ‘alien.’ And how in the world was he playing all of that stuff with just one hand??? Soon after that clinic, Johnny and I were introduced through a mutual friend. I was teaching a drumline at the time and Johnny was looking to help teach a drumline to showcase his sticks (JohnnyRabb Stick Co.) and to teach the kids the FHT. Wait, WHAT?!? OK – I get the whole stick thing, but teach the kids the FHT and get them to play together? As someone that loves the thrill of adventure, I of course accepted the challenge; but honestly at first I never thought we’d have any success. Not only did I learn the technique for myself, but I learned that it is a very teachable technique and is really a viable tool that every drummer/percussionist should have in his arsenal. Now the point of this blog is not to go from start to finish explaining how to perfect the FHT. I’ll let Johnny do that in his book – “The OFFICIAL Freehand Technique” which is available through Hudson Publishing. It really is a great book; take it from me…I just went through most of it in preparation for my aforementioned masterclass as a primer and to get my left hand a little more in gear!!! Rather, the purpose of this blog is to explore the benefits of having the FHT at your disposal. Some of you may have already stopped reading this blog, as you “don’t need to learn another trick…you just want to learn how to groove!” OK – yeah you probably need to work on making sure you can groove…and yes the FHT could be used as a ‘trick’…but it’s not! Although I’ve heard it a ton of times, and I know Johnny has heard it a million times, I really think that only the narrow minded would consider this just a trick. 3 – by being able to play complex rhythms with one hand, I had another hand that was free to mute, change the pitch of the drum, use other implements, turn the snares off and on, etc. This way multiple timbres can be achieved that would normally take 2 drummers to be able to pull off simultaneously. But wait, there’s more!!!! As a percussionist, the possibilities become endless. Consider this as one of many possibilities: Sure we all try to play clave, cascara, or maybe a partido alto rhythm with one hand and play a different rhythm or solo with the other – but imagine playing cascara with one hand and playing ANYTHING you want with the other (like a blazing timbale solo). Drumset players; it’s simply a no-brainer. It’s not just about speed, although a lot of guys are using this technique now to put together some killer blast beat patterns. Ghost notes, ostinatos, 4 way independence – it’s all taken to a different place and a different level when you can play whatever you want with just one hand (sextuplets, 32nd notes, etc.). And don’t forget what I said before – your musicality can be taken to a whole different level, too. I can also see the possibility (and maybe I should just write it) of some unique multi-percussion pieces being written that utilize the FHT. One of my favorite parts of being a percussionist in college was working up some fun multi-percussion pieces for jury. A lot of these pieces utilize ostinatos and complex syncopation between the two hands. Just imagine the possibilities that can be explored. So I believe that without a doubt, the FHT- learned and utilized properly, can be an amazing instrument that any serious drummer or percussionist should have at their disposal. Should you use it all the time? Probably not… Can you expand your horizons, musically speaking? Absolutely!!! Is it hard to learn? Not at all. Look at it this way; I think that it is almost 100% comprable to the open stroke roll. Meaning: the first time you learned the open stroke roll, it took awhile, didn’t it? Such is the case with the FHT. It will take a bit of time to master. Ironically you use a lot of the same concepts and ideas as learning an open stroke roll. But when you do get it together, it is time well spent! 5 Responses to "Musical Benefits of the “Freehand Technique” a.k.a. the One-Handed Roll"
This is a great blog. I really appreciate you taking the time to share the technique to your readers and students. You rule! Chris for this blog to be written late at night, I think you did an outstanding job and can’t wait to jump into learning the FHT. I will be searching for Johnny’s book soon. next time you are back in IL, you better drop me a line…. Dude – for sure! We should do a gig/jam sometime – would be a lot of fun! 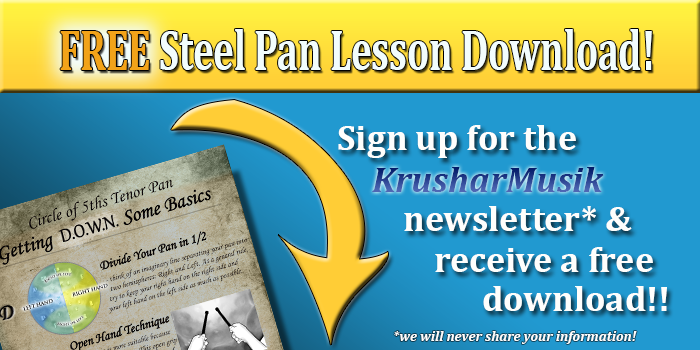 Free Lesson Download When You Sign Up! Copyright © 2016 KrusharMusik. All Rights Reserved.